This is an arbitrary series of accessions created in May 2002 to bring together interviews that focus on lumbering, woods work, and river drives that are not associated with specific projects. Many were previously assigned to the Maine/Maritime Folklore Collection, the General Collection, or those of individual interviewees or collectors. Taken in the early 1940s on the St. John River. Mr. Field told the interviewer that the sled looked like the one he'd used. Alfred Bernard, Sr., interviewed by Jayne Lello for FO 107, fall 1972, Howland, Maine. Andrew Chase, interviewed by Linda Edgerly for FO 107, October and December 1971, Orono, Maine. Armand Dumond, interviewed by Peggy Madore for FO 198, September 2, 1974, Van Buren, Maine. Arnold Hall, interviewed by William Bonsall for FO 107, October – December of 1970, Bangor, Maine. Asa Flagg, inteviewed by Rhoda Mitchell for FO 107, October & November 1970, Carthage, Maine. Benjamin Cole, interviewed by Larry Gallant for FO 107, October and November 1972, Glenburn, Maine. Carroll C. Noyes, interviewed by Lynn MacFarland for FO 107, October and November, 1970, Dixfield, Maine. Charles W. Joy, Martha Davis, Maude Goggins, Frieda Hillgrove, Edward Murphy, and William Silsby, interviewed by Joy for Folklore 107, fall 1969, Ellsworth and Veazie, Maine. Dan McCrae and Ed Oliver, interviewed by John Peck for FO 107, October and November 1972, Bangor, Maine. Emile Leavitt, interviewed by Sarah Burbank for FO 107, fall and winter 1972, Old Town, Maine. Ernest Kennedy, interviewed by Lillian Shirley for FO 191, fall 1970, Argyle, Maine. Frank Carey, interviewed by Rita Swidrowski for FO 107, fall 1971, Milford, Maine. Frederick Burke, interviewed by Norma Coates for FO 107, fall 1971, Bangor, Maine. George Bagley, interviewed by Ronald Bean, July 15, 21, and 22, 1976, at the home of Earl Grass. Grover Cleveland Field, Clyde Willard, Lester Cole, and Raymond Olmstead, interviewed by Dorothy Bodwell, spring 1970. Grover Swett, interviewed by Florence Ireland, August 21, 1970, Bangor, Maine. Guy Kershner, interviewed by Scott MacDonald for FO 107, fall 1972, Farmington, Maine. Harold Stuart, interviewed by Florence Ireland July 15, 1972, Machias, Maine. Harold Tague and Kenneth Packard, interviewed by Jill Allen for FO 107, fall 1971, Stratton and Carrabassett, Maine. Harry Dyer, interviewed by Jeanne Milton for FO 107, October and November 1970, Caribou, Maine. Harry Harold Dyer, interviewed by Jeanne Milton, April 1, 1970, Caribou, Maine. Interview with Louis Coleman and paper about him by Joseph Coleman, Spring 1987. Interview with Rodney Richard Sr. by Stephen Richard, Summer 1980, Rangeley, Maine. John Colbath, interviewed by Beth Hartman for FO 107, winter 1972, Bangor, Maine. John Sharpe, interviewed by Lillian Shirley for FO 107, fall 1970, Old Town, Maine. Leo Poirier, interviewed by Bobbie Violette for FO 198, February 20 and 23, 1974, Madawaska, Maine. Leon St. Jean, interviewed by Bobbie Violette for FO 198, September 1, 1974, Van Buren, Maine. Lester Twist, interviewed by Ralph Cook, December 7, 1973, Medway, Maine. Maxine Michaud, interviewed by Maxine Michaud (Maxine Michaud interviews his grandfather who has the same name) for HY 10, St. Agatha, Maine. Mrs. James Shea, interviewed by David Currier, March 14, 1970, Bangor, Maine. Roland Snowman and Russell Nutting, interviewed by Lynn MacFarland for FO 197, spring of 1971, Weld and Farmington, Maine. 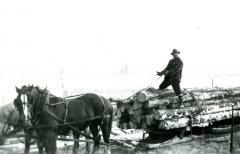 Series of interviews with Erroll “John” Haley about early logging, by Stephen Richard. Thomas Hurd, interviewed by Bessie Dam, April 27, 1975, Burlington, Maine. Vernon Annis, interviewed by Marilyn Maffucci, fall 1976, Lucerne, Maine. Victor Bushey, interviewed by Sue Dauphinee for FO 107, October to December 1972, Bangor, Maine. Volney Roberts and Lee Roberts, interviewed by Linda Hubbard, March 31 – April 14, 1970, Greenville, Maine. Walter Scott, interviewed by Christine Gordon, August 12, 1976, at Scott’s home in Winn, Maine. Walter Scott, interviewed by Ralph Cook for FO 107, November 5, 1973, Winn, Maine. Willard Jalbert, interviewed by Peggy Madore for FO 198, February 19 and 21, 1974, Van Buren, Maine. William Briggs, interviewed by Lynn Ohlhorst for FO 107, October 19 and 28, 1972, Howland, Maine. William Hudson, interviewed by Florence Ireland, July 15, 1972, Machias, Maine.